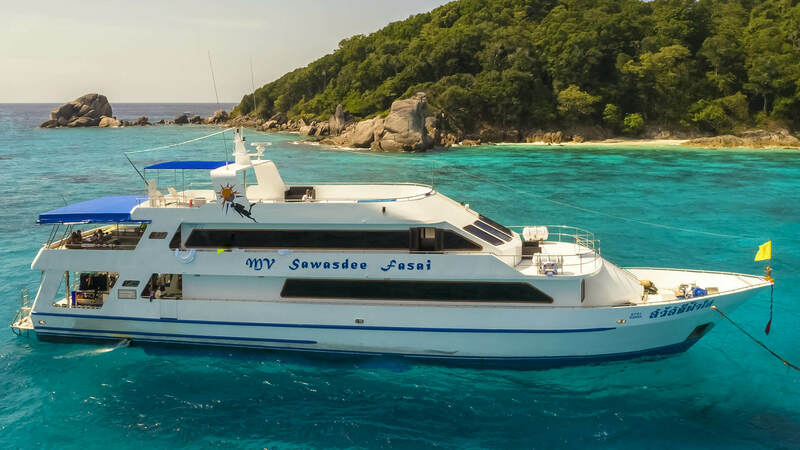 Sawasdee Fasai was launched in 2016 running trips through the high season to the Similan islands and Richelieu Rock. 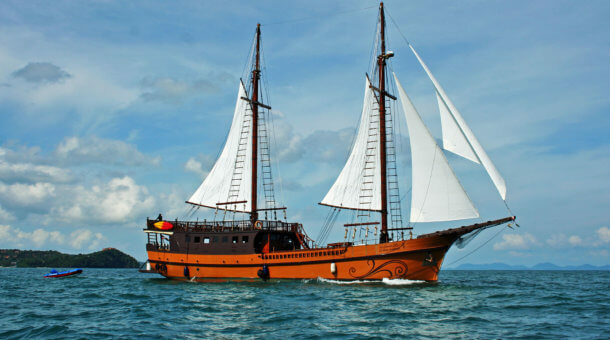 This is a very large (37 meter long) liveaboard with plenty of space for relaxation. There is a big aircon indoor saloon area on the main deck, and also a covered outdoor dining area. And you'll find not one, but 2 sundecks and a very large dive deck too. Sawasdee Fasai has 15 cabins for a maximum of 30 diving guests. There are 2 Master double or twin bed cabins on the main deck along with 5 Deluxe twin cabins. You will find 4 Standard cabins (which can be twin or double) and 4 budget twin cabins on the lower deck. Every cabin has air conditioning and there are en suite bathroom in all cabins except budget. Early Booking Offer : 10% Discount on Trips October 2019 - May 2020! 10% Discount on all trips October 2019 – May 2020! Free Nitrox on all trips! Sawasdee Fasai has been newly renovated and refitted and started trips in December 2016. She takes a maximum of 30 divers with accommodation in 13 cabins. On the main deck are 2 Master double cabins and 5 deluxe twin cabins, all with bathrooms and aircon. The lower deck has 4 standard cabins (double or twin) with bathroom and 4 budget cabins which use a shared bathroom. There is lots of relaxation space in a large indoor saloon and an outdoor (shaded) dining area, with 2 large sundecks too. Sawasdee Fasai offers free Wifi when the boat is in range of Thai mobile signals. 3 meals are served per full day. Meals will vary each day and will comprise of Thai cuisines, fresh seafood, and international dishes. The cook will ensure that you are well looked after for every meal on board. Food will be attentively prepared to suit your requirements. Snacks, tea and coffee are available throughout the day. Sodas and beers are for sale. One of the best boats in the area and often fills up months in advance with group charters. 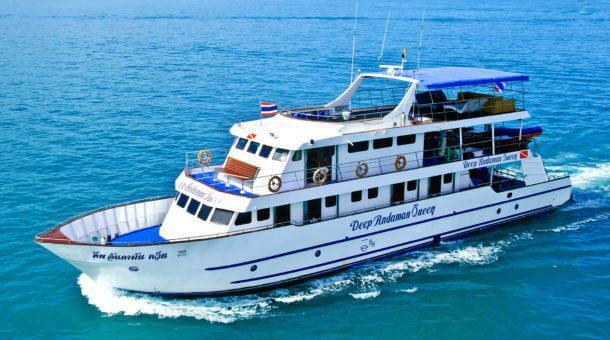 Rental equipment is provided by Sunrise Divers for our divers on the Sawasdee Fasai liveaboard. Rental price is 500 Baht per day for a set (BCD/regulator/fins/mask/wetsuit) and 250 Baht per day for a dive computer. We have a large equipment room at our dive center with 30 sets of Aqualung BCDs and regulators and a large selection of long and short wetsuits, open heel and full foot fins. If you need to rent equipment we suggest you meet at our dive center on departure day, so you can try all equipment before departure. If not possible to meet at our shop, no problem, we will pack extra equipment in different sizes. Torches for night dives 100 Baht per dive. 15 liter tanks available 300 Baht per day. Nitrox is available on board FREE for Nitrox certified divers (12 liter tanks) – for 15 liter Nitrox 300 Baht per day. PADI Advanced Open Water course is 8,800 Baht. PADI Enriched Air (Nitrox) course is 8,800 Baht. Drinking water, coffee, tea are included. Sodas are 30 Baht. Local beers are 80 Baht. Wine 750 Baht per bottle. There is a welcome drink on boarding. Sawasdee Fasai runs trips for 4 nights to the Similan Islands, Koh Bon, Koh Tachai and Richelieu Rock through the season from October to May. Note : This is an approximate itinerary. 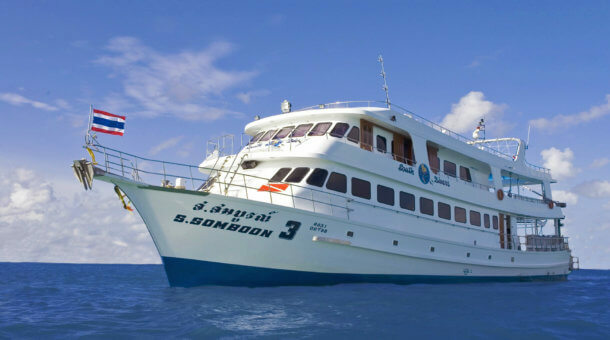 The 4 night trips include 14 dives at the Similan Islands, Koh Bon, Koh Tachai and Richelieu Rock. Exact dive times will vary from day to day. There will be time for a couple of beach visits during the trip.